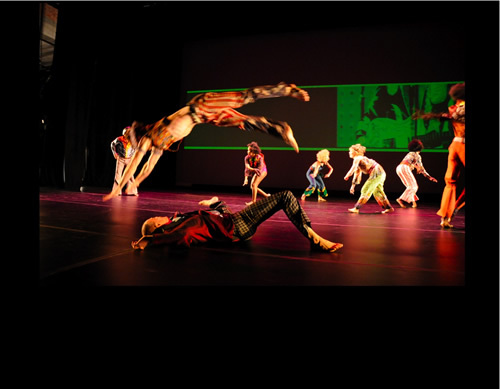 Samford University's Leslie S. Wright Fine Arts Center concludes the 2013-14 Signature Series with a three-day residency featuring David Dorfman Dance. The residency includes workshops, classes and a performance of "Prophets of Funk: Celebrating the Music of Sly and the Family Stone" on Thursday, April 17 at 8 p.m. This residency is part of the Wright Center's work with the Dance Touring Initiative (DTI) and is funded in partnership with the National Endowment for the Arts, South Arts, and the Alabama State Council on the Arts, according to Sean Wright, director of the Wright Center. The DTI program is comprised of nine presenters from throughout the Southeast who collaborate to bring substantial dance residencies to the region with an aim of audience development and community engagement. This month, David Dorfman Dance will spend three weeks in the Southeast, bringing residency activities and performances to four communities, concluding with the residency in Birmingham April 14-17, Wright said. Tickets for the April 17 performance are $15-$25, with student tickets just $10. Tickets are available online at tickets.samford.edu or by calling the Samford Arts Box Office at 205-726-2853. Regular box office hours are 9 a.m. to 5 p.m. Monday through Friday. "Prophets of Funk" is an evening that celebrates Sly and the Family Stone's groundbreaking, visceral, powerful music, and the struggles and celebration of everyday people. Dorfman and Sly and the Family Stone find common purpose in the prophetic possibilities of music and dance that invite everyday people to find ardor in the muck and mess -- the funk -- of life, Wright explained. "Prophets of Funk" seeks to lift up the spirit of Sly: insisting that in the face of this funk, there are still hopes and aspirations that reside in all of us. As part of the Dance Touring Initiative, David Dorfman Dance will conduct workshops, classes and outreach activities around the community in the days prior to their performance. Activities include a master class for community dancers and dance instructors at Children's Dance Foundation in Homewood, a movement workshop with consumers at Piper Place, a workshop and demonstration for residents of Galleria Woods Senior Center in Hoover, a dance class for athletes at Samford and a partnership with Birmingham City Schools. The outreach will extend to the audience on the night of the performance, as attendees will have the opportunity to learn a short dance from members of the company in the Wright Center Lobby, starting at 7p.m. and then join the company on stage for the encore of "Prophets of Funk." "David Dorfman Dance is one of the premier dance companies in America, and the Dance Touring Initiative is an important program as we look to build life-long audiences for dance throughout the Southeast," Wright said. "Thanks to South Arts, we are able to provide a unique opportunity to bring these artists face to face with a diverse set of populations across the Birmingham area. Students both young and old, dancers and non-dancers alike will be able to learn and dance with this incredible company. David Dorfman has long said it is his mission to 'get the entire world to dance' and we hope that this residency will inspire individuals all across Birmingham to get up and dance." Since its founding in 1985, David Dorfman Dance has performed extensively in New York City and throughout North and South America, Great Britain and Europe, most recently in St. Petersburg and Krasnoyarsk in Russia and Bytom and Cracow in Poland. David Dorfman and the company's dancers and artistic collaborators have been honored with eight New York Dance and Performance ("Bessie") Awards. Following their performance at Samford, the company will head to Turkey, Turkmenistan and Uzbekistan for residency and performances, having been selected as one of just three American companies to take part in the Dance Motion USA cultural exchange program.